One bitcoin is currently a bit cheaper in South Korea by $100, with trading volumes there seemingly plummeting from their heyday of billions of dollars a day in just one exchange. Back then, one bitcoin was at times $1,000+ more expensive in South Korea than in other global exchanges, but those sort of gaps might now be closed by the launch of a Korean Won stablecoin from the team behind Block By Block Capital. “The 4 BXB Capital co-founders decided to self-fund a separate initiative to create the stablecoin. We’re leveraging the networks and some of the existing partnerships from BXB Capital, but KRWb is a separate company,” Alex Friedberg, BXB co-founder, told Trustnodes. They’re currently in the beta phase with the ERC20 KRWb smart contract already out. Some $300,000 worth of KRW has already been tokenized, with Friedberg stating a 3rd party audit report has been published in South Korean awaiting English translation. You can currently buy KRWb through their AirSwap space, where they’re “working with QCP Capital to offer market liquidity” according to Friedberg. We wanted to buy one KRWb so that it can decorate our testrun eth address, but they’re currently being offered in blocks of 1 million tokenized won, worth about $1,000. “Under our previous activities at BXB Capital, we build strong relationships with many of the top Korean crypto exchanges through our crypto trading and arbitrage activities. Meaning that Korean money might soon fly through the ethereum blockchain with the technical aspects here seemingly being not much different than for other ERC20 stablecoins smart contracts. “All Korean exchanges are not regulated at current times, which includes Upbit, Bithumb, Korbit, Coinone, etc. “Anytime a new product is introduced into a market, it definitely should have some impact. We’re very hopeful that it will help normalize the global price disparities. Arbitrage has been one of the main use case of tokenized fiat in addition to providing a very high level of convenience and accessibility. One can’t think of an easy way of getting your hands on KRW, for example, or even dollars if you’re outside of USA. There’s obviously plenty of physical exchange points, but in an on-demand world that may appear as too much work for a new generation. While in more remote places, it might require traveling to a new town, or a new city, or perhaps even to a different country. In contrast, even the most remotest of villages probably have at least one smartphone. So allowing the tokenized dollar and now the tokenized won to instantly travel to all corners of earth. It is that speed and convenience that has allowed stablecoins to gain a market cap of $3 billion or so, with Tether alone handling at times $6 billion or more in trading volumes. USDT is everywhere. From South Africa to China, Arabia, Russia, Europe and both Americas with stable coins very popular in crypto only exchanges and in decentralized exchanges. 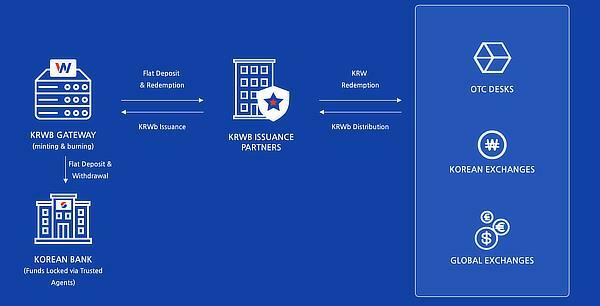 Whether a non-usd tokenized fiat would be popular, however, remains to be seen as KRWb is the very first non-dollar stablecoin as far as we’re aware, with tokenization so marching on.